Bob O'Luney - Amazing One Man Band! Bob O’Luney has been called a clown, a musical novelty, a freak of nature and much more. Most of these characterizations aptly describe this zany entertainer, who is truly one of a kind. As a living example of a rare breed of musician, Bob O’Luney has amazed audiences across the country with his ability to walk, chew gum and play music at the same time. At home in almost any situation, Bob has surprised and delighted audiences of all ages with his mad-cap show at private parties, parades, festivals, amusement parks and shopping malls. With an array of instruments attached to various appendages he manages to attract a “Pied Piper” following wherever he performs. His music and his comic demeanor are hard to resist! As a trained musician, Bob O’Luney has had experience with a wide variety of musical styles and he incorporates these into his routine. His repertoire spans many generations, from the old-time music of the early 1900’s to country-western and swing, from good old rock ‘n’ roll to his own version of rap. He’ll even make up a song on the spot by special request! Bob O’Luney is definitely a unique performer, and one guaranteed to attract attention. He loves to stroll through a crowd and mingle with his audience as he performs. He needs no stage and no amplification, so he can work in virtually any situation. 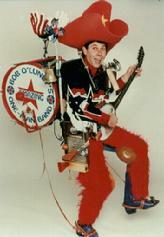 For a bizarre treat at your next function, go for something completely different: Bob O’Luney’s Amazing One-Man Band! Read the Bob O'Luney Review from Westword Newspapers - click here!